Plymothian Transit: Plymouth Civic Centre Listed! Plans to redevelop the heart of Plymouth were dealt a body blow yesterday with news that the crumbling Civic Centre building has been listed Grade II by English Heritage. The change in its status will make it harder and more expensive to redevelop the site.The news comes little more than a week after Plymouth City Council announced that it had chosen Exeter-based Rok Development to carry out its plan to demolish the building and redevelop the site.The new council headquarters would have been built at either Millbay or Bretonside. The Civic Centre would have been replaced by a mixed-use development.The Civic Centre needs structural repairs which would cost at least £10million.It is understood that the decision by English Heritage was taken after an application by six private individuals. As you can imagine this news has not been welcomed by many people at all! The area is badly in need of redevelopment. The staff working in the building are among the many people who have expressed outrage that the building is being listed. Quite where this leaves the council and its plans remains to be seen. I think we will be hearing a lot more about this over the coming weeks. The only reason it is in need of refurbishment is becasue it was never looked after. The Civic Centre contains some exceptional works of art, and is externally treated in high quality materials such as marble, granite, limestone, and also italian mosaic tiles. I've always thought The Civic Centre is an extremely striking and powerful building, and to be honest, i'm suprised it has not been listed sooner. I'd rather see this building stay then risk having another Drakes Circus style disaster replacing it. I hope this news means the council re-opens the rooftop resturant that has sat empty since the seventies, people would surely love to see the views from the top, and this could also change the publics opinion of the building. I have lived in Plymouth for 10 years now, and i have never seen a city so far behind in tradition and aesthetics. It seems that the public do not like any kind of change, and listing the monstrosity that is the Civic Centre proves this. Ok, the new Mall is an architectural disaster, but at least it is modern. What these six members of the public have done is again, stopped the development of a city that is way behind every other city in Britain. I suspect these people have lived their whole life in the South West, and have nothing better to do with themselves. The previous comment mentions that the building is 'striking' & 'powerful'. !! What a load of rubbish. It is a big lump of crumbling concrete with glazing!! Come on Janners, give yourself a shake, and get with the 21st centuary. Spend some money and travel for a year, and you will understand. The civic centre is not the most attractive building in the world, but that is not what listing buildings is about. It;s about preserving buildings of special interest historically. The civic centre may not be a stunning example of architecture but it is representative of that 1950s architecture. It was built after WW2 and is a brilliant demonstration of post-war architecture, and it's extremely short-sighted to demolish something because it's a `monstrosity`. 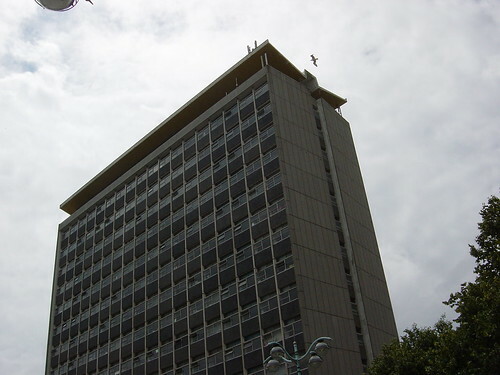 Like most of the buildings in plymouth, the civic centre has never been cared for properly and to be honest if you want to improve a building, why do you have to knock it down? Surely there are far more imaginative ways of making a building more attractive than simply bulldozing it? It may cost money but how much is knocking it down and buying new materials going to cost? Just because currently the type of popular building is the Travel Lodge in Plymouth's colours of blue orange which quite frankly make the civic centre look beautiful, does not mean that we should knock the building down. Who is to say that in fifty years time this architecture might be revered? Look at how many historically valuable buildings have been destroyed because they are `unfashionable`. Concrete bunkers from WW1 are preserved, builings which are by no stretch of the imagination attractive but useful historically, are listed. In response to the previous comment, just because something is modern, doesn't mean it's good. In the 1950's the Civic Centre was modern and look what's happening to it now! All that will happen is the council will waste millions of pounds on building something modern, only for it to be knocked down in fifty years because it's considered dated or old-fashioned. I have lived in plymouth for ten years as well and I think that suggesting those six people need to travel more is narrow minded and ridiculous. Before I moved here I lived in Brunei, Oman, London, and France; however the amount I've travelled does not affect my viewpoint. Obviously this person does not understamd how the grading system works and has turned to insults when reason has failed them (and I'm well aware that I'm probably doing the same). I think Plymouth is lucky that those six people had the foresight to act before something irreversible was done. I'm sorry; I know that I've ranted but this is something I feel very strongly about. I have lived in Plymouth for several years now, and while the Civic Centre may be a shining example of 1950's architecture, it is still hideous. Allowing this monstrocity to be listed proves Plymouth's desire to live in the past. I'm sure if any of those 6 people have ever left the south west, they will have herd the American phrase "While its 10am in New York, its 1532 in Plymouth" and now it is starting to appear that the americans are right. This city needs to modernise itself, or risk being left in a sea of crumbling concrete and "chavs". I’m really stumped by this one. Lived in Plymouth for 3 years and yes, absolutely stunned by how far behind other cities it is and the way the Plymothians seem to be dead against ANY sort of change. At first I thought the city centre was an awful concrete monstrosity….but the only problem is its not concrete on the main streets (Armada Way and Royal Parade) – its actually high quality Portland stone – looks like concrete if allowed to get dirty but as we can see with some of the buildings that have been cleaned, they actually look OK if looked after properly. So…what about the Civic Centre. Personally, I feel it’s not great but it does seem more interesting to look at than ‘typical’ post war office blocks, probably due to the slightly cantilevered design where the lower floors of the tower over-hang the base a bit. It’s true it is INCREDIBLY shabby and has loads of tatty metal structures attached on top of the roof. But as with some other city centre buildings how would it look if it had a major refurbishment (imagine if the north and south flanks were coated in copper plate to match the new University building!)? Plymouth definitely needs a load of new tall buildings (as far as I’m concerned all the low rise buildings on the side streets off Armada Way should be demolished out of hand) but the grade 2 listing on the Civic Centre at least give us time to think about this one which, ugly or not, does seem to be an icon of the post-war redevelopment. The building is simply ugly. It needs to be altered drastically or removed totally. So what if it has some interesting building materials? The thing is an eye sore, plain and simple. I think the Civic Centre should go personally. I've lived in Plymouth ALL my life and to be honest, although I love my home town to bits, the Civic Centre is bringing it down. It totally contradicts what Plymouth is becoming. I mean it completely goes against what David Mackay (Architect) wants and I think his Vision of Plymouth is great. It preserves the historic, IMPORTANT parts of Plymouth. The Civic Centre is, as most people have stated, a complete monstrocity. Ugly and pointless. Not many of us enjoy living in the past and that's exactly what the Civic Centre is...the past. Although places like the Barbican and Charles Cross are the past, at least they are decent in the looks department and they are looked better upon than the Civic Centre. English Heritage need some good proof that the Civic Centre is unloved by a majority of people I know, at least. Also the building has Concrete Cancer. It's crumbling and what are they going to do with it when it crumbles to the ground. I'm actually pretty sure the Council won't let it get THAT far. They aren't keen on it anyways. As soon as there are any signs the building will come down, they'll have it down to prevent any hazards. It all makes sense that it should be knocked down and rebuilt but in a way that suits everyone, even those for keeping the Civic Centre. Heck, they could even preserve all the art and valuable stone inside the building and keep it as a reminder of what once was. People need to start realising that the Civic Centre is not loved and is, generally, uncared for. There is more than enough evidence for DCMS to have the Listed Status lifted so the building can be done away with and good riddens when the building does come down. Erm...I ranted didn't I? Haha, aw well. All the same, my opinion on the Civic Centre. You either love it or you hate it huh. I have lived in Plymouth for 16 years, and honestly the Civic Centre is disgusting. A crumbling pile of concrete and cement, it has no particular value to Plymouth...What kind of history does it have exactly, so some elderly woman came and officially opened it..so what if it was built after some sadistic Austrian man with a memorable moustache raged war... its enough to turn anybody away. And as for Mackay and his ''Vision'' he is still living in the 1940's. I propose we do this, that and the other... With what money? Do you think for one second, nobody is going to revolt from your stupid ideas? The Civic Centre needs urgent attention! Bella...the Civic Centre is disgusting and no one likes it (or at least most people don't) and as for Mackays vision...he is the one that designed Drake Circus and if a building like that was seen in the 40's then I'll be damned. All Mackay wants is a more modern city with high rise, light spacious buildings. I think it might do Plymouth some good. Take it from someone who has lived in Plymouth their whole life. all well and good knocking it down but tax payers will still have to pay for the new building. which will probably cost alot more than the ten million to refurbish this classic example of 20th century architecture.if the council had looked after it in the first place and kept the original structure then it still would of looked striking.